Anyone who's familiar with the Rocky series knows that Rocky IV is the best one. It's the one in which that great song Eye of The Tiger is so epically employed, where the underdog-turned-champion from Philadelphia, now the underdog again, must face the insurmountable monolithic opponent from the Soviet Union, Ivan Drago (famous for some good one-liners including "I must break you"), in order to defend his country's honor and to avenge the death of his friend Apollo Creed. Man, it's a good one! In the Rocky movies, the fight is always just the climax. The real story is in all that leads up to the fight. 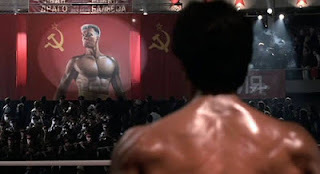 In the case of Rocky IV, it's really about Rocky's rigorous training in preparation to do the impossible. Given a lodging in the middle of nowhere, in the frozen wilderness of the Soviet Union, Rocky has almost no resources with which to prepare himself. He has to get creative; running in the snow, bench-pressing logs, doing pull-ups on the rafters... While, by contrast, Drago has a million-dollar work-out facility with high-tech training equipment and world-class sparring partners. Rocky has to overcome not only the physical challenges of his sport, but the challenge of the scarcity of resources. Rocky's story is actually the story of humanity; some are afforded the resources to succeed, others are not. And while in reality there are stories like Rocky's--stories of those who, without resources, work their way to unlikely success--the problem with Rocky and the stories like it is that they begin to penetrate our imagination in such a way that we begin to impose Rocky-like expectation on those without resources instead of calling economic injustice itself into question. The one child who emerges to success from her poor neighborhood becomes the standard to which we hold her peers rather than the one exception to a cultural injustice in need of correction. If a flower grows through a crack in the concrete, of course we should celebrate the flower, but that doesn't mean we should also settle for the concrete. We shouldn't expect every flower to find a crack, we should take a jackhammer to the concrete and make it into a garden. Some kids have all the resources they need in order to succeed: parents who can provide for them (so that they don't have to find their own source of income) and can help them study, a computer with access to the Internet, after-school programs where they can receive tutoring, all the books they need for their intellectual nourishment, good teachers who are able to provide a healthy learning environment and a quality education, and mentors who can encourage them along the way. Other kids just don't have those things. Now, put yourself in the shoes of a college admissions board member. You get the transcripts of two applicants; one who grew up with the resources, one who didn't... The former sporting a 3.5 GPA, the latter posting a not-too-shabby 3.0. You have to choose between the two. If you've seen a few too many Rocky movies and hold "equality" to be the definitive component of fairness, you might be inclined to choose the kid with the 3.5. But if you're sensitive to the reality of injustice and you're in tune with the mythology behind the narratives of American individualism, then you might see that the meager 3.0 GPA is actually more worth your investment. We do not all have the same access to ladder of success (which for some just means basic health and sustenance). We should not assume that everyone starts out on the bottom rung. some actually start well on their way up, others start well below the bottom. 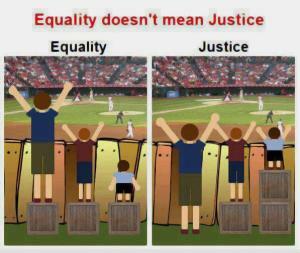 Justice means recognizing this truth and providing the means necessary for everyone to reach the ladder. It also means recognizing that the ladder analogy itself is flawed because it carries the presupposition that we are basically in this on our own and for ourselves, that climbing to the top is the meaning of life, and that it is virtuous to accumulate more and more wealth... The truth is, we actually share the ladder and if all you care about is getting higher up, you'll quickly forget that you should be helping the people around you, even if it means stepping down a few rungs. Don't let the mythological narratives of American individualism rob you of your compassion and your search for justice for the flowers that don't manage to grow through the concrete.